Chihaya gives it her all in a tournament game. 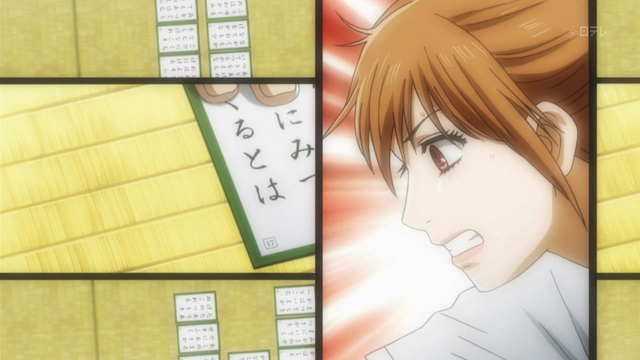 Chihayafuru episode 4 brings us back to the present. Chihaya Ayase, now a high school freshman, tells her old friend, Taichi Mashima, to come see her advance to grade A in the tournament that weekend. Before the tournament we get a glimpse of how she struggled to get better, and afterwards we get a sad conclusion. Childish promises between Chihaya, Taichi, and Arata Wataya. 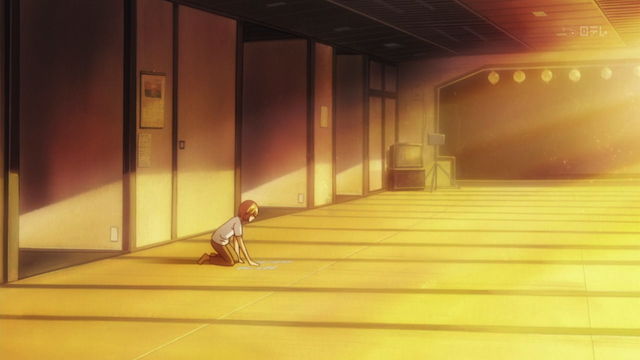 In middle school, without her friends, Chihaya trained alone. While Taichi gave up on Karuta, probably under the influence of his family, who discourage him from trying things that he doesn’t naturally excel at, Chihaya maintained the passionate pursuit of Karuta. Even alone she practiced, and saw track practice as an opportunity to keep herself fit, and train her reflexes with Karuta being the ultimate goal. This show has an interesting way of continuing to spoon out information about the game of Karuta without making it seem dry. In this case, the continuous cycle of memorizing and forgetting card placement is explained to burn sugar in the brain. 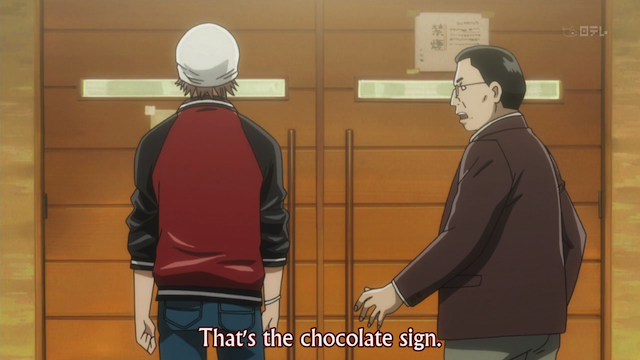 To keep her sugar levels high, Taichi, who is observing Chihaya’s matches, is sent out to buy some chocolate, but the convenience store is closed, and he has to buy at an expensive chocolatier, instead. Chihaya crashes after stuffing herself with chocolate. I think this little scene was intended to accomplish several things. First we see Taichi being a nice guy, and covering her with his coat (and getting teased by Harada-sensei for it). But I think it is also another way of showing Chihaya’s nature. She is so comfortable with herself, and with other people that she falls asleep in front of them. This openness was earlier described as “saying the first thing that comes to mind”, but she is consistently shown as acting openly, with a minimum of guile. Her emotions rise plainly to her face, and, yes, she speaks what’s on her mind. Taichi and Harada-sensei observe from outside the hall. 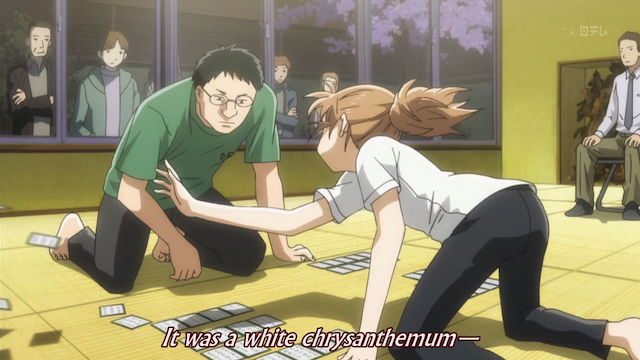 Chihaya engages in an all-out battle over a single significant card. The other interesting way that Karuta gameplay was shown was that the notion of taking a card from one’s opponent was the fundamental tactic demonstrated in the final round for the A Classification. Chihaya and her opponent, Yasuda, push the “Chihaya card”, that we have seen several times, back and forth into their opponent’s hand. This is described as a more aggressive form of play, because, assuming you can take the card from your opponent, your own cards, that you placed yourself and memorized, remain, giving you a slight advantage. Kyaa moment. Chihaya X Taichi. When Chihaya looks up to share her happiness with someone, Taichi is there. I don’t think this was a romantic hug for Chihaya, but I think Taichi still has a thing for her. As much of a jerk as Taichi was as a kid, I have to admit that unrequited love is the only true love, so I’m all in favor of moments like this — separated by only a moment from Taichi getting shut down once again. 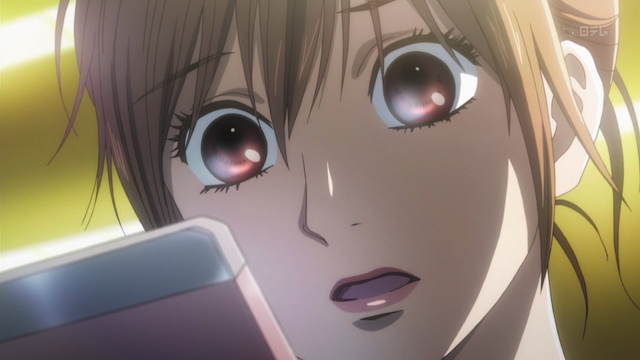 In this case, Chihaya immediately calls Arata to tell him the news. Arata Wataya -- they keep his face hidden, and apparently he lives in almost total darkness. Obviously something went wrong for him somewhere along the way. Arata doesn't want to hear about it. 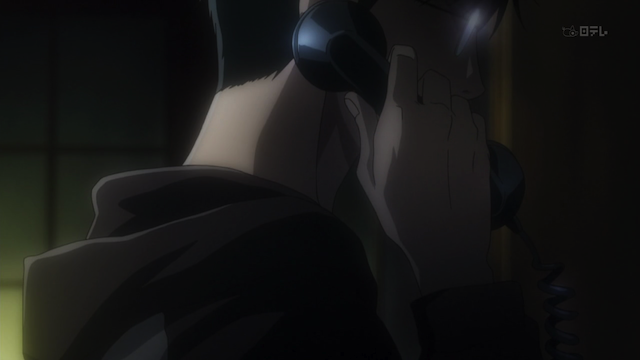 He tells Chihaya never to call again, and hangs up on her. 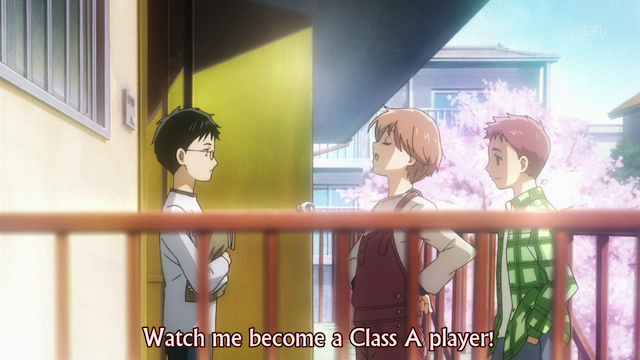 Chihaya has finally achieved what she struggled towards for years, she is now an A Class Karuta player (which I believe gives her the right to join in the national tournament where she thought she would play against Arata). Unfortunately her childhood wish, that her friends would all meet again to play Karuta one day must now seem like a broken dream. Taichi might have been roped into playing, but Arata, of all people, has turned his back on the game. This show does a great job in balancing the card game angle with an engaging character drama. The conflicted emotions of the main trio as children was very compelling, so I’m really looking forward to seeing how things continue, now that the characters have grown. I think Chihayafuru’s just like any other sports manga – although it is interesting how Karuta’s made so /exciting/, any other good sports manga does the same with a sport, whether it’s football or go. Even Yu-Gi-Oh makes card games interesting (though there isn’t so much childhood drama there…)! Maybe showing Taichi as a nice guy is supposed to show how he’s matured from being a douche-kid into a nice-guy. I don’t know, though – more episodes will probably tell. 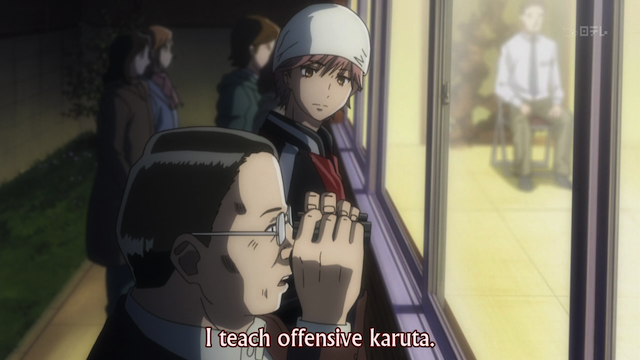 Yes, I think Chihayafuru works as a perfect example of a sports anime.